One of my favorite countries in Europe is Italy. Cities like Rome, Florence or Venice are spectacular spots to visit all year long. The climate as well as the Italian way of live is unique and lets you leave your everyday live behind for one weekend. Especially Venice is one of these places that attract me in a special way. When I come to town I always take the water taxi from the airport. It´s a bit more expensive, but worth every penny. During my last stay I took a hotel that was located in the centre of Venice island, so the water taxi dropped me off directly at the Rialto Bridge. The history of the city in combination with the old buildings, countless bridges and canals makes every visit worth it. Even the climate is good enough to enjoy your pizza in a shirt outside of the restaurant and if it rains, there are still enough ice cream shops which offer amazing types of ice cream. Although I know Venice already quite good, it seems that I discover new sites each time I´m back. One of the characteristics are the buildings like the tower of the Greek Orthodox church San Giorgio dei Greci. What makes it so special, besides the architectaral characteristics, is the fact that there are many bridges from which you have a wonderful view to the building. Dressed in denim all over I discovered the city on my first day. Shortly after I left the hotel I found this bridge with a stunning view. 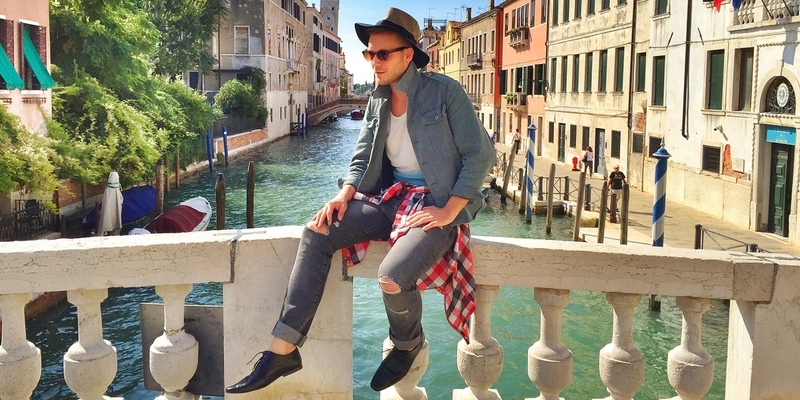 Wearing my favorite ripped jeans and Fedora hat, I enjoyed the sun while gondolas pass me by. You have an amazing style, seriously!